The ideal fixing for securing number plates without the risk of theft. The clutch head screws can be installed using a standard slotted screwdriver, but the unique design of the head prevents them from being undone. Manufactured in A2 Stainless Steel for increased protection from corrosion. Supplied with 6 cover caps (2x white, 2x yellow, 2x black). The white and yellow are designed to blend in with the colour of the number plates, with two additional black ones for where screw holes are placed where a digit is located. 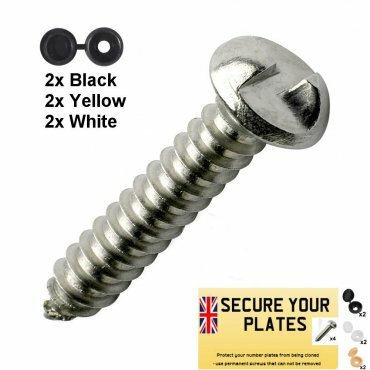 If you have more then 2 screws in places where letters and numbers exist, let us know and we'll swap colours over to match your requirements (you can add this in the notes section during checkout, or reply to the order confirmation with your requirements). Discounts available for those with bulk requirements for fleet vehicles. Let us know how many you need and we will provide a custom price for you.